25 - 09 - At Pink Pank, Rotterdam, NL. 14 - 07 - At OKO, Amsterdam, NL. 24 - 06 - At Wunderbar, Rotterdam, NL. 17 - 06 - At Wolfart Project Space, Rotterdam, NL. 09 - 06 - Solo set at Corridor Project Space , Amsterdam, NL. 09 - 06 - At Studio Loos, Den Haag, NL. 02 - 06 - At TransformatieLab, with Orkest de Ereprijs, Arnhem, NL. 12 - 05 - Arvind Ganga, guitar, Dirar Kalash, Violin, J.A. - guitar, City Art, Rotterdam NL. 17 - 04 - Breathing is Habit, for ensemble, premier, Krakows Composers Festival, Krakow, PL. 18 - 03 - Readymade - Ivan Cruz - doublebass, Julien Moussiegt – percussion, J.A. guitar, Rotterdam, NL. 25 - 02 - Readymade - Hugo Costa – sax, Romeo Mayor – trumpet, Margje Ottevanger – stem, J.A. – guitar, Rotterdam, NL. 19 - 11 - Readymade - Riccardo Marogna – sax, Hugo Costa – sax, Philipp Ernsting - drums,, J.A. – guitar, Rotterdam, NL. 04 - 11 - The Performance Bar, Margje Ottevanger, stem, J.A. - guitar, Rotterdam, NL. 30 -10 - Workshop on music improvisation, Escuela TAI, Madrid , ES. 26 -10 - Studio Loos, Arvind Ganga - guitar, Liew Niyomkarn - guitar, J.A. - guitar, Den Haag, NL. 27 - 09 - Seeds, Ryszard Lubieniecki, Łódź, PL. 09 - 04 - Readymade - Koffie and Ambacht, Rotterdam, NL. 08 - 04 - J. A. - guitar - solo set NIFFO Galerie, Rotterdam NL. 29 - 03 - Improv sesion at Studio Loos , The Hague , NL. 17 - 02 - Hugo Costa-Saxophone, Philippe Ernsting-Drums, J.A.-Guitar Helicopter, The Hague,NL. 15 - 02 - SEE, Sonology Institute, The Hague,NL. 14 - 02 - Dirar Kalash-Oud, Leo Svirski-Accordion, Jasper Stadhouders-Guitar, J.A.-Guitar WORM, Rotterdam,NL. 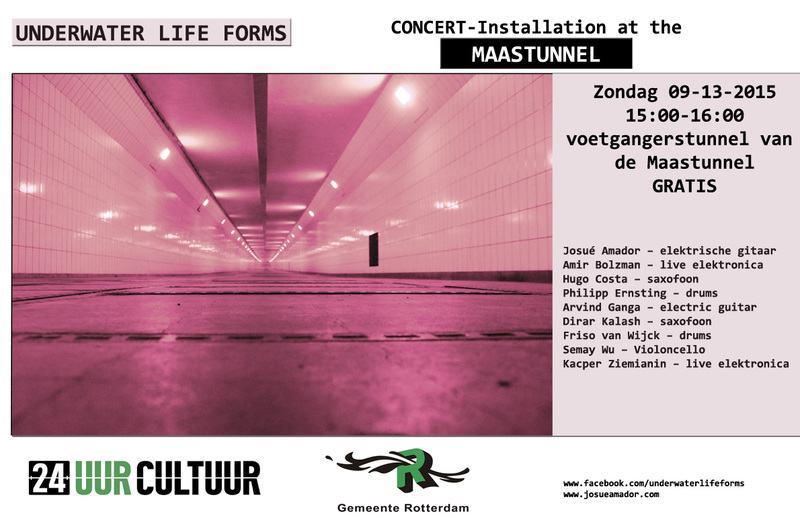 11 - 02 - Ligconcert , Margje Ottevanger - voice, J.A.-Guitar, Centrum Adem-Halen , Rotterdam,NL. 25 - 11 - Unity , Trio Layers Słuchalnia Festival, Turun,PL. 06 - 11 - CODARTS Composers Ensemble NIFFO Galerie, Rotterdam NL. 29 - 10 - W. Terrazas Fl, Dirar Kalash- Vln, Arvind Ganga- Guit,, J.A. - Guit - Koffie and Ambacht, Rotterdam, NL. 27 - 10 - Trio set Wilfrido Terrazas Flute, Leo Svirski - Piano, J.A. - guitar - City Art Rotterdam, NL. 17 - 09 - Music Box Sound Installation - Rotterdam Central Station. 04 - 08 - Duo set, Dirar Kalash - saxophone, J.A. - guitar - NIFFO Galerie, Rotterdam,NL. 04 - 05 - Unity - Trio Layers - Competition Città di Barletta, Bartetta, Italy. 24 - 04 - A.S.K. Trio Dirar Kalash - Oud, Leo Svirsky - Accordion, J. A.- guitar - Music in transition. The Hague, NL. 22 - 04 - There - for Bass Clarinet - Tomasz Żymła B.Cl. Cracow´s Composers Festival - Krakow, PL. 31 - 03 - A.S.K. Trio Dirar Kalash - saxophone, Leo Svirsky - piano, J. A.- guitar - City Art Rotterdam, Rotterdam,NL. 06 - 03 - Unity - ( World premier) - Trio Layers - Koncertkirken , København, DK. 19 - 02 - Unity - Trio Layers - Accordion Festival at Mław, PL. 28 - 01 - A.S.K. Trio Dirar Kalash - saxophone, Leo Svirsky - piano, J. A.- guitar - Studio Loos , Den Haag, NL. 07 - 12 - Lecture - Rotterdam Conservatory CODARTS - Rotterdam, NL. 07 - 11 - Form and Content, for flute soloist and ensemble. - Ensenada, MX. 15 - 09 - Underwater Life Forms, for 10 improvising musicians. - 24uur cultuur festival, Rotterdam, NL . 18 - 06 - Domino Kwartet - Regentenkamer, Den Haag, NL. 14 - 06 - Lecture/Workshop: Improvisation in Contemporary Music Practice - Academy of Music in Krakow, Pl. 29 - 05 - There, for Bass Clarinet , Thiago Tavares, Rotterdam Conservatorium, NL. 08,09 - 05 - Lecture/Workshop: Improvisation in Contemporary Music Practice - Academy of Music in Krakow, Pl. 31 - 03 - SEE - Koninklijk Conservatorium, Den Haag, NL. - 20:00. 13 - 03 - There, for Bass Clarinet - An Object in Time I ,for a group of Bass Cl - Maison du Japon, París, Fr. 03 - 02 - SEE - Koninklijk Conservatorium, Den Haag, NL. - 20:00. 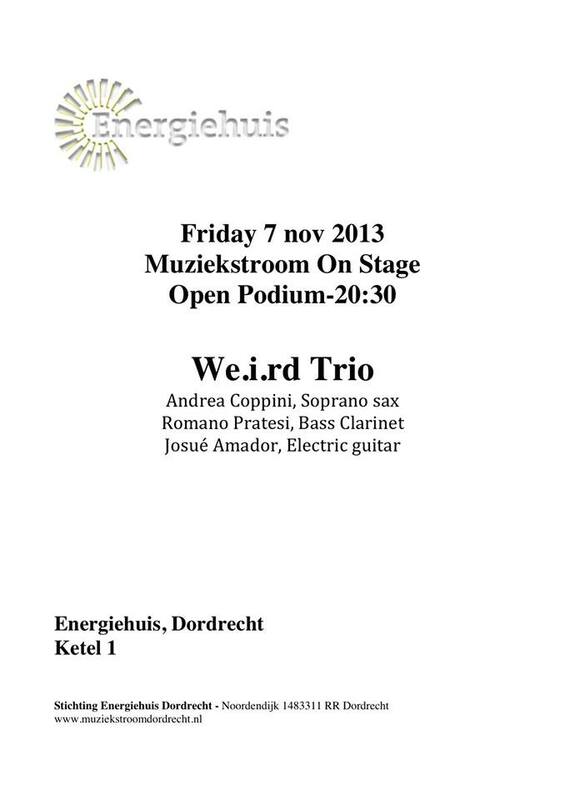 07 - 11 - Andrea Coppini, Romano Pratesi, Josué Amador Trio, Muziek Stroom, Dordrecht,NL. 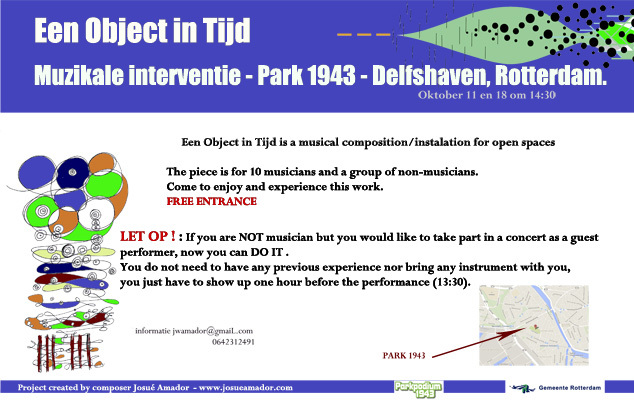 18 - 10 - Een Object in Tijd II , for brass and percussion. Park 1943, Rotterdam,NL. 11 - 08 - SEE - Institute of Sonology, Den Haag,NL, 19:30. 27 - 06 - Premier - An Object in Time I , for a group of four or more Bass Clarinets - Rotterdam, NL. 16 - 05 - World premier - 050607 for Famele Singing Violinist - Krakow, Poland. 29 - 04 - Slack Tide - Lutosławski Orchestra Moderna - Krakow, Poland. 25 - 04 - SEE - Spring Festival. Kees van Barenzaal Koninklijk Conservatorium, Den Haag. NL. - 19:00. 17 - 04 - SEE - Koninklijk Conservatorium, Den Haag, NL. - 20:00. 28 - 11- SEE (Sonology Electroacoustic Ensemble ) - Koninklijk Conservatorium, Den Haag, NL. - 20:00. 04 - 10 - FIN Ensemble - Poortgebouw , Rotterdam,NL. 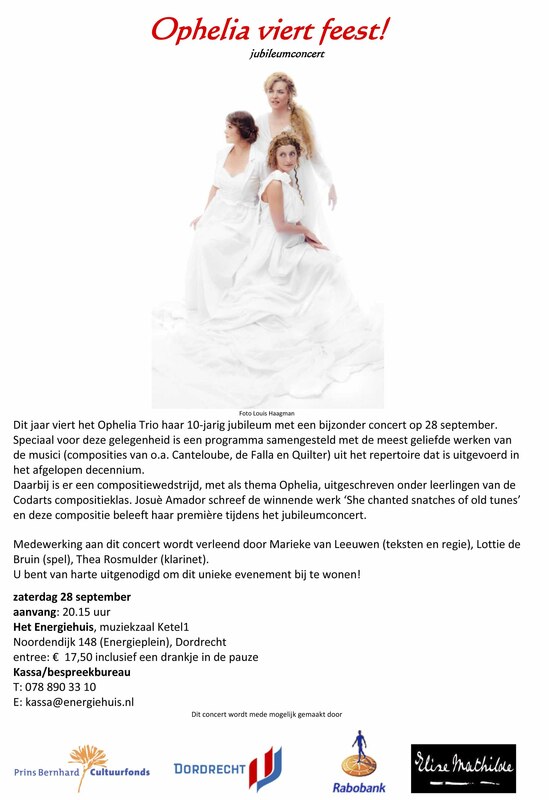 28 - 09 - World Premier - She Chanted Snatches of Old tunes - Ophelia Trio - Het Energiehuis, Dordrecht, NL.